Jazz's off hind following a run in with the electric fence. It went right down to the bone on the inside of his leg and about halfway through the flesh on the outside. Photo taken at his first bandage change, 3 days after the injury. This was February this year, it's now fully healed and he's been back in ridden work since May. He was never really lame on it and we were very VERY lucky he didn't do serious damage to himself. 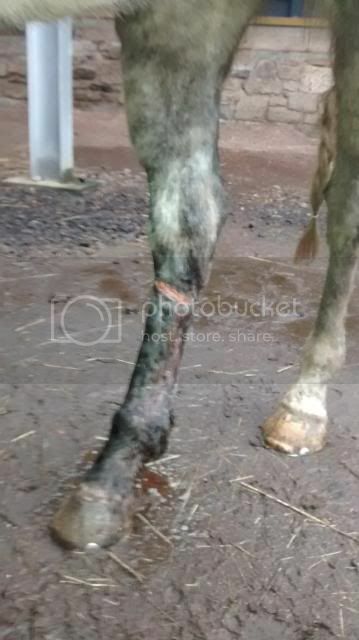 I don't have any more recent photos but he now has a cracking scar, I think because the wound is so close to the hock we really had no chance of getting just a fine line of scarring! This is Dylan's near hind a few days after being kicked while turned out. This turned out to be a hairline fracture, it opened up one night and he had to be PTS. 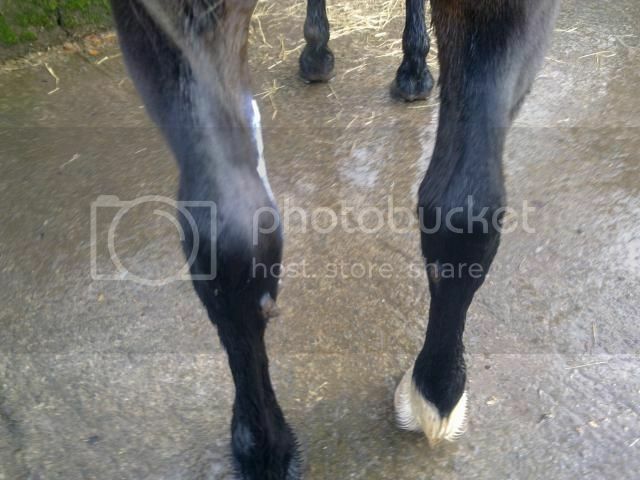 Before the fracture opened he was totally sound and was being lunged in walk, trot & canter. My horse suffered a puncture wound through his coronary band, but has just continued to grow downwards. I lost a horse about 18 months ago to a broken leg whilst she was walking sedately round the garden. Vet thinks she had a hairline fracture that gave way, horse played a high level polocrosse tournament just two days earlier completely sound and we have no incident that we can think of that would have caused it in the first place. Was a total shock and very sudden. Oh wow, that looks like the part of the actual coronet that grows the new horn has been damaged, so the new hoof isn't growing down at that point, thus creating the gap. 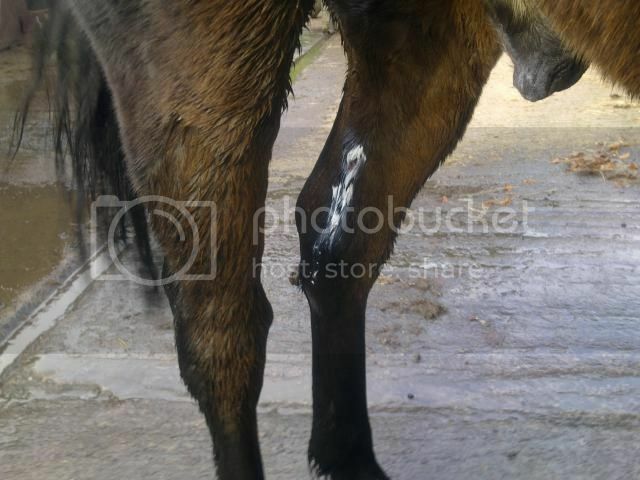 A lady I used to livery with had a pony with a hoof similar to that on a hind hoof. He had what looked like a 'cloven hoof' as the gap ran from the coronet to the ground but the gap was to the side. He was sound, in full ridden work, but was always shod to prevent the gap from opening. I think that getting a really, really good farrier to look would be the best thing (and I'm sure that you've done this already). Another case of hives. 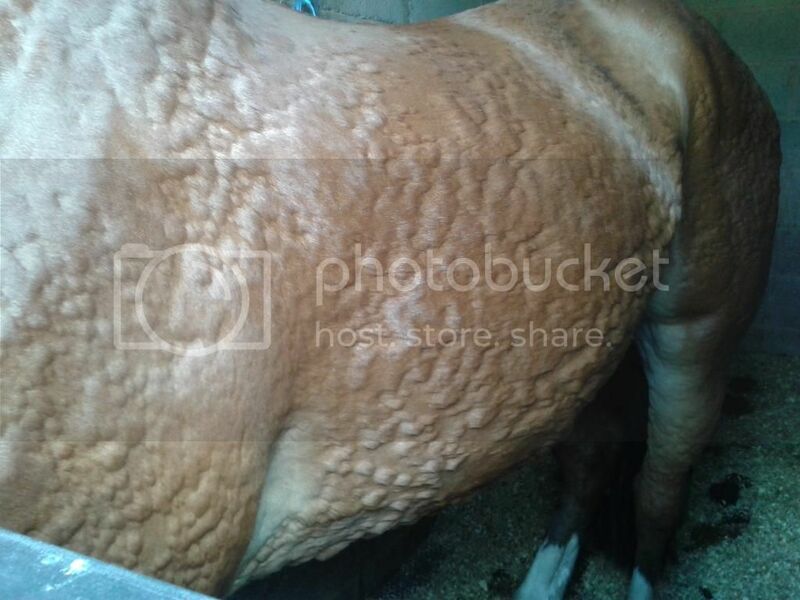 Horse reacted to an unknown stimulus resulting in approx 80% of body being covered in raised 'bubble wrap' swellings. Swellings reduced and disappeared over the next few days. If she is a little worse for wear, you will be getting the vet out... Ask them at the same time.